I have the same gap between panels by the headlights. Is there an adjustment under the panels to tighten that up? Yes, my 2019 exhibited the exact same issues - passenger side wide gap on the outside of the headlight and rubbing/chipping in the same location on the driver's side. This showed itself within 15 miles on the ODO. I read about these issues before I bought and waited for a 2019 painted in the new paint shop because I had been told that the 2019's would not have this issue. Well, so much for that. My rear bumper on the passenger side was rubbing against the quarter as well. The bottom line is that I don't see why this will not recur unless you fix the panel fitment issues and prevent the friction. A local dealership has made two attempts at fixing the panel fitment on mine - the second approach seems more promising but I wasn't able to get more than 10 miles on it before I had to store it. They appear to have fixed the rear bumper issue before it started chipping. 70% of my car is Xpel'ed, including the bumper. My advice, if you want to be really conservative, is to put the wrap on pause if possible and have the dealer address it, although you might be disappointed in their ability to. I would also advise you to NOT let them respray the bumper as you are likely to come out of it with more problems (especially since black shows everything). Although I noticed my chips only when I dropped it off for the Xpel (I drove it right there after the car was delivered to me), I proceeded anyway because I knew I wasn't going to create problems for myself with a respray. If the rest of the paint on the bumper is good (mine was perfect), find somebody who does chip repair on high end cars and address it as a localized paint issue once it is no longer rubbing. If they are good you wouldn't know it was ever repaired. I hear you can have GM ship you a new bumper from the factory if you want to go that route. I didn't have this option because my color (Watkins Glen Gray) was discontinued. My panel fitment/chipping issue is really the only complaint I have on the car, so while it is in my opinion still ridiculous on a $80k car, sometimes you need to just do your best to do what you can and accept an imperfection or you'll make yourself insane. Last edited by mdolandese; 01-26-2019 at 04:18 PM. I live in South Florida. 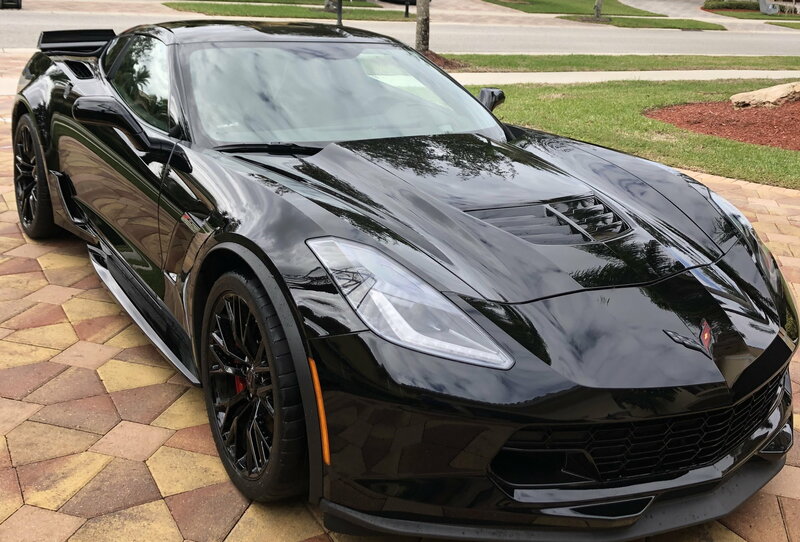 Just got my 2019 Black Z06 last month. There were 5 black Z06's that I passed on at various dealerships because they all had that same paint issue by the drivers side headlight. I was getting frustrated in my search and thinking I was just going to have buy a messed up one and have it fixed. I would say about 60% of the new 2019 Vettes I looked at around here in any color had the defect. The Miami dealer (Bomnin Chevrolet) did offer to fix the issue under warranty on the cars that were defective. Last edited by KMAC70; 01-26-2019 at 07:13 PM. Looks great. I'm glad you found one without panel alignment/paint problems. It's ridiculous that GM still hasn't resolved the issue. Last edited by Oneslackr; 01-26-2019 at 08:42 PM. My black 2019 Z. Mine looks fine. No paint chipping. My only regret did I buy the wrong color. LOL. I passed on a yellow 17 ZO6 at Kerbeck because of the same issue in the same spot, Went with a black car with no alignment issues. Very Happy with car after 2 yrs and 9k miles. HA! "I was worried shitless the whole time" This is exactly why I did not order one from the factory. I saw that almost all of the new 2019's at the dealerships near me had the paint defect. I did not want to order one, wait 8 to 12 weeks, and then have it arrive with the defect. I would have been so pissed.... Glad your's came perfect! Also, I checked my panel gaps every day for the first month. Kept putting a little spray wax there by the headlight. (even though the panel lined up perfectly even with enough of a gap) I just wanted to make damn sure my panels were all good and that the paint would not start chipping!